We all have moments where we fall prey to cravings. If you’re reading this there’s a good chance that your average craving, like mine, is for a sandwich. And when these cravings strike we are often able to seek out our local favorite, or a new establishment we’ve had our eye on for a while, or we simply head to the kitchen and see what we can put together. But what happens when that need strikes in less opportune times? I headed out with the full intention of buying this sandwich, but in my mind I was imagining a situation of much uglier circumstances. I pictured myself stranded on foot, heading through an unfamiliar city, beset by a foul mood or a string of bad luck. In such a situation I might say to myself that I just want a sandwich, any sandwich will do. What sandwich am I most likely to come across? Is it likely to be any good? If, in my darkest moments, I put my faith in fate and just go for the nearest sandwich, am I likely to meet satisfaction or further dismay? This is almost certainly geographically specific, but if dropped at random the only thing you’re more likely to come across than a Subway is a 7-11. So 7-11 was the natural choice to explore this hypothetical set of unfortunate circumstances, and 7-11 is where I went. Look at the name of the sandwich for a moment. Ham & Turkey, and Bacon Club on Wheat Bread. Why is the first “and” an ampersand and the second one the full conjunction? It feels as if the cold cuts and the bacon have been segregated somehow, almost placed in different philosophical categories. What necessitated this? The label also includes “with tomatoes,” but doesn’t include the information that lettuce is present. Again, there seem to be two sets of rules for two different ingredients. It’s hard to overstate how unsettling I find that. But I went to the 7-11 for the sandwich, and I was not going to leave empty handed. I went into this with pretty low expectations, but this sandwich still managed to fall short. The tomatoes are tasteless mush, the ham and turkey are flavorless & uninspired, and the bacon…the label doesn’t mention that the sandwich contains mayo, but it does. It contains a lot of mayo. This is likely to protect the bread, but it’s so much mayo that it manages to match the bacon in intensity of flavor. Granted, it’s particularly bland bacon, but just consider that. The sandwich featured flavors of bacon and mayonnaise in about equal proportion. If that sentence doesn’t horrify you, well, let’s just say you and I worship at different churches. I only ate half of this number, because while I’ll swallow a bitter pill in the service of sandwich blogging, swallowing two is just silly. Returning to my earlier hypothetical situation, what I learned in eating this sandwich is not very comforting. It raises the question of whether any sandwich is better than no sandwich at all, an issue which I am not prepared to settle at the present moment. It’s a larger question than this sandwich can answer, and I hope that the next time I consider the issue I’m not in a strange city, walking the streets desperate for a sandwich, any sandwich at all. This entry was posted in Sandwich Reviews, Slummin' It and tagged Cold Cuts, Sandwiches I Have Eaten, Sandwiches I Wouldn't Finish, Sandwiches Made For Me, Slummin It by Pete. Bookmark the permalink. I very much enjoyed this review. It made me think of a lonely man in a strange city that needed the touch of a woman and ended up at a cheap whorehouse. I don’t think I’ll be having a sandwich at 7/11 anytime soon. That is why the only thing I trust at 7-11 is the Jamaican beef patty, as the entire philosophy of the sandwich is clearly spelled out in the name, along with all the ingredients: it is beef from Jamaica in patty form. Nothing more, nothing less. Try the Smoked Turkey & Jack Cheese with Southwest Mayonnaise. Same packaging. I was in the hypothetical situation that you described and was pleasantly surprised. 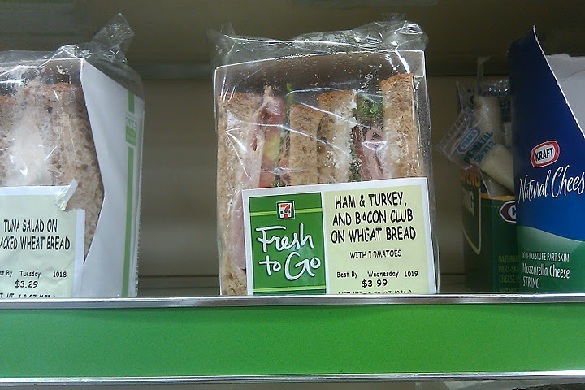 My positive experience prompted me to try the Ham & Turkey and Bacon Club the next time I was at 7-11… not so good. Hmm. A long, long time ago I was thoroughly disgusted by a 7-11 Cuban. That makes me 0-2, and hesitant to give them a third chance. Still, should I find myself in the above situation again I will consider your advice. Thank you. One other point: 7-11 sandwiches have freshness dates printed on them and keep sandwiches for 2 days. I always get ones made that same day when I’m in the 7-11 scenario. There are very few things, I can only think of two offhand, that you can safely consume purchased from a Seven-Eleven; one is milk, and then only after checking the expiry date, the other a bag of cookies. This is enough to get you home or through the day. The nutritiousness of the milk balances the nonsensical cookies, so you won’t go to hell after all (unless you go back).